I saw Sweeney Todd for the second time last weekend (I saw it in the U.S. when it came out there at the end of December), and I must say, I liked it more the second time around. I enjoyed it the first time, but I found myself too caught up in all the spurting blood and dead bodies and cannibalism, so I couldn’t really enjoy it. I was just waiting anxiously for the next kill. 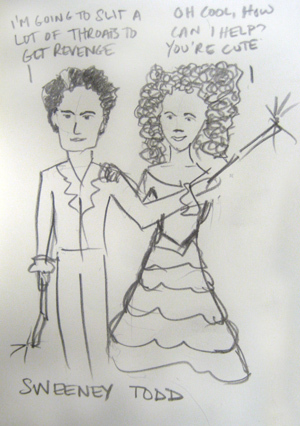 I still think that Anthony is the weakest part, but Johnny Depp and Helena Bonham Carter are great. As are Sascha Baron Cohen and the little boy. The fantasy sequences are my favorite. Especially when they go to the seaside. Sometimes funny and always excessive, whether it’s the masses of blood, showmanship or singing, I’ve been humming the tunes all week now.